Thursday, 12, 2013, was the Feast of the Holy Name of Mary, the observance of which was instituted by Blessed Pope Innocent XI in 1683 shortly after the victory won by the King of Poland, Jan Sobieski, over the Mohammedans at the Battle of the Gates of Vienna, which had been fought to keep the infidels from overrunning the entirely of western Europe. The Most Holy Name of Mary was invoked by Pope Innocent XI in 1683 as he prayed her Most Holy Rosary to retard the onslaught of the wanton killers who belong to the "religion of peace," as it has termed by former President George Walker Bush and Barack Hussein Obama and honored by conciliar "pope" after conciliar "pope," including Jorge Mario Bergoglio/Francis in the past six months,Mohammedanism. This is what Pope Saint Pius V had done as he prayed the Rosary to support the combined Christian fleets as they battled the Turkish fleets in the Battle of Lepanto one hundred twelve years before. Our Lady, who has crushed the head of the devil with her heel, is our sure refuge against all of the devil's minions (Freemasons, Mohammedans, adherents of the Talmud, secularists, political ideologues, heretics, apostates) in every age of history. Our Lady wants us to rely upon her to do battle with the devil and his minions in our own lives on a daily basis, enabling us to be ever ready to lift high the Cross of her Divine Son, at which she stood so valiantly on Good Friday (and at which she stands every time the Sacrifice of the Cross is re-presented in an unbloody manner in the Holy Sacrifice of the Mass by a validly-ordained Catholic priest). The Holy Cross of Blessed Lord and Saviour Jesus Christ was lifted high throughout Europe during Christendom. The Crucifix was displayed prominently in every village and city and rural community. All eyes were thus fixed at every moment on the central fact of our Faith: that the Word Who was made Flesh in Our Lady's Virginal and Immaculate womb became Incarnate so that He could pay back in the Sacred Humanity He had received from His Most Blessed Mother by the power of the Holy Ghost the blood debt of sin that was owed to Him in His Infinity as God. Our Lord's total surrender of Himself to His Co-Eternal Father's will effected our redemption, making it thus possible for us to cooperate with the graces from He won for us by the shedding of every single drop of His Most Precious Blood on the Holy Cross as they are administered to us by Holy Mother Church in the sacraments. Salvation comes only from the One Who hung on the wood of the Cross as that Cross with His own Crucified Body affixed to It is held high by the Catholic Church. Everyone on the face of this earth is meant to be converted to the Cross of Christ. Everyone on the face of the earth is meant to stand fast with Our Lady and all of the angels and saints at the offering of Holy Mass, particularly for Roman Rite Catholics at the Mass that Our Lord Himself taught the Apostles to offer before He Ascended to the Father's right hand in glory forty days after His Resurrection. The Cross of the Divine Redeemer is meant to permeate deep into every fabric of personal and social life. There is not one part of our own individual lives or of the larger life of our nation and that of the world that is not meant to be referenced absolutely and at all times to Our Lord Jesus Christ, the Crucified King of Love. Everything, without any exception whatsoever, must reference the Holy Cross, the instrument upon which our salvation was wrought. We make the Sign of the Cross every time we start and close our prayers, invoking each of the three Persons of the Blessed Trinity. God the Father is appeased by the offering of His Son on the wood of the Holy Cross in Spirit and in Truth. God the Son is pleased to do the will of the Father in obedience and love to Him and out of love for the souls whose sins had made Him the blood sport of cruel men. The Third Person of the Most Blessed Trinity, God The Holy Ghost, Who hovered over the Cross on Good Friday, extends this one Sacrifice of the Cross in time through the sanctifying vivification He makes possible in the life of the Church and thus in the life of the souls who receive worthily the sacraments. We make the Sign of the Cross every time we pass by a Catholic Church, signifying our recognition that Our Lord, although He sitteth at the right hand of God the Father Almighty, is yet the Prisoner of Love in the tabernacle, just as He was the Prisoner of Love for us as He was knitted together in His Sacred Humanity for nine months in the tabernacle of Our Lady's Virginal and Immaculate womb. We make the Sign of the Cross every time we bless ourselves or others (it should be a family practice for parents to bless their infant children with Holy Water in the Name of the Father, and of the Son, and of the Holy Ghost before they go to sleep, teaching them to do this for themselves as soon as they are able) with Holy Water, being reminded that our souls were reborn in the Baptismal font as the very inner life of the Blessed Trinity entered our souls by means of sanctifying (habitual) grace. We should make the Sign of the Cross every time we get into our cars and pray one Hail Mary, invoking her as Our Lady of the Way, mindful that the Shadow of the Cross is meant to hover over us wherever we travel and it is Our Lord's victory on that same Cross that must impel us to journey in this mortal life as Catholics who give no quarter to secularism in any way, shape or form. We should make the Sign of the Cross every time we begin any work or activity. Indeed, although I no longer support major league baseball with my own money and attendance, I do read about the sport now and again. And every once in a while there are stories about players, some of whom make the Sign of the Cross every time they go to the plate to bat, who do so after some incident. Former New York Mets' pitcher Rick Reed did so in the late 1990s when he caught a line drive that almost hit his head. Former Mets' outfielder Cliff Floyd, now with the Chicago Cubs, made the Sign of the Cross as fellow outfielders Carlos Beltran and Mike Cameron were carried off the field on stretchers following a collision at Petco Park in San Diego, California, in August of 2005. We should make the Sign of the Cross many times during the day as this helps us keep in mind that we are called to lift high the Cross always and everywhere and with everyone. Every true bishop and true priest who offers the Immemorial Mass of Tradition makes the Sign of the Cross thirty-three times, one for each year of Our Lord's life on earth, as he offers the Spotless Victim of Calvary in an unbloody manner to the Father in Spirit and in Truth. The Sign of the Cross will be made upon our lifeless corpses after we have breathed our last, teaching us that it is only because the Son of Man was lifted high on the Cross that we have even the remotest possibility of knowing an ending Easter Sunday of glory in Heaven. The shadow of the Cross hung over Bethlehem, where the Newborn Babe was placed in a feeding trough, a manger, made of wood, a foreshadowing of the fact that He would be fastened by our sins to the wood of the Holy Cross, which has become for us the true manger from which we are fed His very Body, Blood, Soul, and Divinity in Holy Communion. The Sign of the Cross is made by an alter Christus as He administers to use the saving balm of the Divine Mercy in the Sacrament of Penance, established by Our Lord after His Resurrection to be the Sacred Tribunal in which the merits of the shedding of His Most Precious Blood can be applied to the souls of erring sinners unto the Last Day through Holy Mother Church. Images of the Holy Cross of the Divine Redeemer have worked countless prodigies through the centuries. Its very form has been impressed upon saints, including Saint Francis of Assisi (the Feast of the Impression of the Stigmata on Saint Francis in the calendar of Roman Rite of the Catholic Church is in in three days, that is, on Tuesday, September 17, 2013, and Padre Pio, among others. Images of the Holy Cross have produced countless conversions, that's right, conversions, to the Catholic Church. The Acts [of Saint Felicitas] do not mention what was the age of Potitus when dragged before the tribunals to glorify God in the profession of his faith. From the words used we infer that he must have been very young. In one place he is called an infant, in another a little boy, and more frequently a boy. But, from the custom of those times, a person might be called a boy up to his twentieth year, and an infant to ten or twelve. Thus we venture to say that Potitus was not more than twelve or thirteen when the scenes in his extraordinary career commenced. His father was a pagan, named Hylas. He was opposed to Christianity, and persecuted his son on account of religious principles. How the son came to the knowledge of the Christian faith is not mentioned; but the Acts, as we quote from the Bollandists, commence this interesting record with a touching scene between the pagan father and the Christian child. Hylas used entreaties and threats to change the determination of the young Potitus to remain a Christian. He tried in vain. The boy's mind was illumined by a celestial light, and the knowledge and perception of sacred truth raised him far above the stupidities of paganism. The father, finding him inexorable, was angry, and locked him up in one of the rooms of his house, telling him he would not give him meat or drink until he consented to abandon Christianity. "Let us see if your God will help you now," muttered the angry father, as he drew the key from the door. He left Potitus locked up all night; but in the morning his excited feelings had subsided, and the father's love, which survives every passion, brought him again to the room where his son was confined. He found Potitus cheerfully and merry; love, surprise and curiosity rushed through his mind and urged a thousand questions. Assuming a tone of conciliation and affection, he entered into the following conversation with his son. "O my son! I beseech thee, sacrifice to the gods. The Emperor Antoninus has issued orders that every one that will not sacrifice is to be put to the torture and exposed to the wild beasts. How I regret that you are my only son, and you are so foolish!" "But, father, what gods am I to sacrifice to? What are their names?" "You do not know my child, of Jupiter, Arpha, and Minerva?" "Well, indeed, I never heard that God was called Jupiter, or Arpha, or Minerva. How could He have all these names? O father, if you only knew how powerful is the God of the Christians, who delivered Himself for us and saved us, you too would believe in Him. Do you not know, father, that a great prophet said, 'All the gods of the Gentiles are demons!' It was the Lord who made the heavens, not Jupiter, nor Arpha, nor Minerva." "Where did you learn these things," asked Hylas, quickly and interrupting him. "Ah! father," replied Potitus, mildly, "He whom I serve speaks through me; for He has said in His holy gospel, 'Do not think how or what you will say, for it will be given to you in that hour what to say.'" "But, my child, do you not fear the punishments that are threatened to be inflicted on Christians? If you are brought before Antoninus, what will become of you? Those strange doctrines of yours will cause your flesh to be torn to pieces by hooks, and you will be eaten up by the lions." "Father, you can never frighten me with these things. You must know e can do all things in Him who strengthens us. Did you ever hear that David alone killed Goliath with a stone, and cutting off his head with his sword showed it to all the people of Israel? His armour and strength was the name of the Lord. Yes, father," he continued after a momentary pause, "in the name of the Father, and of the Son, and of the Holy Ghost, I am prepared to suffer everything for Jesus Christ." "O father! believe in our Lord Jesus Christ, and you will be saved. Those gods you serve have no existence, they cannot save you. I will tell you what they are, father! They are spirits that burn in a dreadful fire which they cannot extinguish. How can you be so mad as to worship a piece of coloured wood, or a statue of marble that cannot stir? It is as lifeless as the clay we tread on, as silent as stones at the bottom of the stream; the venomous reptiles that creep on the face of the earth have more power than your idols, for they can take your life away. O father! how can these senseless things have power against the great God who created everything, who stretched out the heavens in all their glory, and dressed our earth in all its beauty, who alone is powerful, and puts His foot on the head of the dragon and the lion?" Another moment and Potitus was locked in the arms of his converted father. Their tears flowed in one stream to the ground--the tears of innocence and repentance. Here is another story from the remarkable life of Potitus, who sought to convert souls to the Cross of Christ as it is held high solely by the Catholic Church. "O Lord Jesus Christ, King of angels and Redeemer of souls! Thou hast said to Thy disciples, 'Make clean the leper, and raise the dead.' Grant to me, Thy servant, that Thy grace may descend on this woman, that this people may see Thou art God, and there is no other God than Thee." He had scarcely finished his prayer, when a light flashed on the body of Quiriaca--she was cured. All her deformities disappeared; she sprung forth from her couch, seized the mirror; her skin became fairer than the purest Carara marble, tinted with the blush of the rose. The attendants gathered round in wonder, and their exclamations of joy and surprise filled the chamber with a confusion of sounds. Quiriaca could not contain herself; messengers were dispatched through the city to seek her husband--to call friends--to announce the joyful news. A few moments and the house, the portico, and the street were filled with people, and the miracle was told and re-told by a thousand tongues. The Acts [of Saint Felicitas] of this miracle was the conversion of half the city (media civitatis). Potitus remained some time to contemplate the great work God had commenced. But finding too much honour and praise were lavished on him, he stole away once more to his favourite retreat on the hills. Almighty God wished him to prepare for other and greater wonders. Before leaving the city, he sent some of the most trustworthy of his converts to Rome, to announce to the holy Pope, Anicetus, the blessings God had conferred on the city of Valeria. A bishop and some zealous priests were sent to tend the flock; through their exertions the whole country round embraced the faith; which they never lost. The city of Valeria, however, has long since passed away; the beautiful but ill-kept cit of Cagliari stands near its ruins. The Acts say that about two thousand persons were converted. All went to their homes from the amphitheatre struck with wonder at what they had seen, and filled with the greatest sympathy for the powerful but persecuted Christians. For days and weeks afterwards, those startling scenes in the Coliseum were the topic of conversation in the lounging rooms of the Baths and the benches of the Forum. The pagans endeavored to explain all their mysteries by omnipotent magic, whilst the Christians sang their hymns of thanksgiving to the true God for the manifestation of His glory. The glorious story of Potitus, one of countless such stories in The Martyrs of the Coliseum, is just one example of how Catholics in the first centuries of the Church feared not to lift high the Cross and to seek the conversion of all people at all times to the true Faith, doing so especially by bearing their share of hardship, as Saint Paul says, that the Gospel entails. That is, we must lift high the Cross after we embrace it in our lives, accepting all of the travails of daily living and all of the unforeseen tragedies that might befall us as occasions to unite ourselves with the Cross of Christ by offering them all through the Sorrowful and Immaculate Heart of Mary. In the year 627, during the reign of the emperor Heraclius I of Constantinople, the Persians conquered the city of Jerusalem and removed from its venerable Sanctuary the major part of the true Cross of Our Lord, which Saint Helen, mother of the emperor Constantine, had left there after discovering it on Calvary. The emperor resolved to win back by combat this precious object, the new Ark of the Covenant for the new people of God. Before he left Constantinople with his army, Heraclius went to the church wearing black in the spirit of penance; he prostrated himself before the altar and begged God to sustain his courage. And on leaving he took with him a miraculous image of the Saviour, determined to combat with it even unto death. Heaven visibly assisted the valiant emperor, for his army won victory after victory. One of the conditions of the peace treaty was the return of the Cross of Our Lord, in the same condition as when it was removed. Heraclius on his return was received in Constantinople by the acclamations of the people; with olive branches and torches, they went out to meet him. And the true Cross was honored, on this occasion, in a magnificent triumph. There is a lesson here: we must be humble to carry whatever crosses God in His infinite wisdom and mercy chooses to send us for our sanctification and salvation, desiring us to offer these crosses back to Him through Our Lady's Sorrowful and Immaculate Heart as her consecrated slaves. We must pray for crosses. The cross is the path of our salvation. 'Through thee the precious cross is honoured and worshipped throughout the world.' Thus did Saint Cyril of Alexandria apostrophize our Lady on the morrow of that great day, which saw her divine maternity vindicated at Ephesus. Eternal Wisdom has willed that the octave of Mary's birth should be honoured by the celebration of this feat of the triumph of the holy cross. The cross indeed is the standard of God's armies, whereof Mary is the Queen; it is by the cross that she crushes the serpent's head, and wins so many over error, and over the enemies of the Christian name. 'By this sign thou shalt conquer.' Satan had been suffered to try his strength against the Church by persecution and tortures; but his time was drawing to an end. By the edict of Sardice, which emancipated the Christians, Galerius, when about to die, acknowledged the powerlessness of hell. Now as the time for Christ to take the offensive, and for His cross to prevail. Towards the close of the year 311, a Roman army lay at the foot of the Alps, preparing to pass from Gaul into Italy. Constantine, its commander, thought only or revenging himself for an injury received from Maxentius, his political rival; but his soldiers, as unsuspecting as their chief, already belonged henceforward to the Lord of hosts. This Son of the Most High, having become, as Son of Mary, king of this world, was about to reveal Himself to His first lieutenant, and, at the same time, to discover His first army the standard that was go to before it. Above the legions, in a cloudless sky, the cross, proscribed for three long centuries, suddenly shone forth; all eyes beheld it, making the western sun, as it were, its footstool, and surrounded with these words of characters of fire: IN HOC VINCE: by this be thou conqueror! A few months later, October 27, 312, all the idols of Rome stood aghast to behold, approaching along the Flaminian Way, beyond the bridge Milvius, the Labarum with its sacred monogram, now become the standard of the of the imperial armies. On the morrow was fought the decisive battle, which opened the gates of the eternal city to Christ, the only God, the everlasting King. 'Hail, O cross, formidable to all enemies, bulwark of the Church, strength of princes; hail in thy triumph! the sacred Wood still lay hidden in the earth, yet it appeared in the heavens announcing victory; and an emperor, become Christian, raised up from the bowels of the earth.' Thus sang the Greek Church yesterday, in preparation for the joys of today; for the east, which has not our peculiar feast of May 3 [that is, the Finding of the Holy Cross by Saint Helena, mother of Constantine--TAD], celebrates on this day one the solemnity of both the overthrow of idolatry by the sign of salvation revealed to Constantine and his army, and the discovery of the holy cross a few years later in the cistern of Golgotha. But another celebration, the memory of which is fixed by the Menology on September 13, was added in the year 335 to the happy recollections of this day; namely, the dedication of the basilicas raised by Constantine on Mount Calvary and over the holy sepulchre, after the precious discoveries made by his mother St. Helena. In the very same century that witnessed all these events, a pious pilgrim, thought to be St. Silvia, sister of Rufinas the minister of Theodosius and Arcadius, attested that the anniversary of this dedication was celebrated with the same solemnity as Easter and the Epiphany. There was an immense concourse of bishops, clerics, monks, and seculars of both sexes, from every province; and the reason, she says, is that the 'cross was found on this day'; which motive led to the choice of the same day for the primitive consecration, so that the two joys might be united into one. . . .
Thou, O Cross, wert the rallying-standard of all Europe in those sacred expeditions which borrowed from their beautiful title of crusades, and which exalted the Christian name in the east. While on the one hand thou wert thus warding off degradation and ruin, on the other thou wert preparing the conquest of new continents; so that it is by thee that our west remains at the head of nations. Through thee, the warriors in these glorious campaigns are inscribed on the first pages of the golden book of nobility. And now the new orders of chivalry, which claim to hold among their ranks the elite of the human race, look upon thee as the highest mark of merit and honour. It is the continuation of to-day's mystery, the exaltation, even in our times of decadence, of the holy cross, which in past ages was the standard of legions, and glittered on the diadems of emperors and kings. If it is true, men have appeared in France, who have made it their aim to overthrow the sacred signs, wheresoever our father had honoured it. This invasion of the servants of Pilate into the country of the crusaders was inexplicable, until it was discovered that they were in Jewish pay. These, as St. Leo says of the Jews in to-day's Office, see in the instrument of salvation nothing but their own crime; and their guilty conscience makes them hire, to pull down the holy cross, the very men whom they formerly paid to set it up [on Calvary to Crucify Our Lord]. The coalition of such enemies is but one more homage to thee! O adorable cross, our glory and our love here on earth, save us on the day when thou shalt appear in the heavens, when the Son of Man, seated in His majesty, is to judge the world! Let's face facts: this has not been done by the conciliar "popes," who believe that "dialogue" and "encounter" will effect justice within nations and peace among them. We must lift high the Cross of Christ, not reaffirm the Masonic principles of the United Nations as the foundation of world peace. The Crusaders of yore held high the Cross of Christ. So must we. Missionaries held high the Cross of Christ. So must we. Martyrs, including the North American Martyrs, gave up their lives as they held high the standard of the Holy Cross as the only foundation of personal and social order. So must we. Our Lady has appeared to us in the past five centuries to convert souls to the Catholic Church, not to any other. Over nine million souls were converted to the true Faith following her apparition to Juan Diego at Guadalupe in 1531. Our Lady has appeared to us in the past five centuries to proclaim the Holy Name of her Divine Son, not to bury it in favor of some Masonic concept of universal brotherhood and "inter-religious" solidarity. She is the Mediatrix of All Graces, as she taught Saint Catherine Laboure. Our Lady began her apparition to Saint Bernadette with the Sign of the Cross, reminding us that we must plant firmly the Cross of Christ in our own souls, in our own homes, and publicly in the soil of the lands in which we live. Our Lady's Most Holy Rosary is adorned with a Crucifix, reminding us that she stood beneath her Divine Son's Holy Cross for three excruciating hours, suffering the Fifth Sword of Sorrow being pierced through her Sorrowful and Immaculate Heart as she suffered completely with her Divine Son as our Co-Redemptrix. We must stand with her at the foot of her Divine Son's Cross every day in the true offerings of the Immemorial Mass of Tradition. Saint Joseph blessed the crowd at Fatima on October 13, 1917, making the Sign of the Cross three times with his foster-Child. It was shortly thereafter that Our Lord was seen carrying in His Cross by Lucia dos Santos as Our Lady or Sorrows appeared to her. May Our Lady's Fatima Message be fulfilled in our lifetimes. May the Triumph of her Immaculate Heart be celebrated in every heart and on every tongue and in every land by lifting high the Cross of the Divine Redeemer and singing Its praises. Hail, O Holy Cross, the instrument of our salvation, the instrument of providing human beings with the only liberty that matters: from sin and the power of eternal death effected by the offering of the God-Man, Our Lord and Saviour Jesus Christ, to the Father in Spirit and in Truth on Good Friday. Hail, O Holy Cross, the Sacrifice of which is extended in our midst every time an alter Christus offers Holy Mass and says Hoc est enin Corpus Meam, Hic est enim Calix Sanguinis, Novi et aeterni testamenti, mysterium fidei: qui pro vobis et pro multis, effundetur in remissionem peccatorum. Hail, O Holy Cross, our only glorious and precious hope! Hail, O Holy Cross, now and forever! 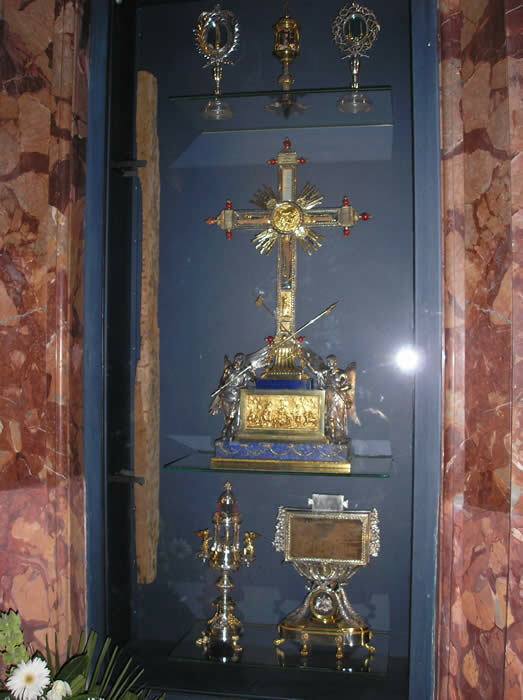 The reliquary of the True Cross, the Church of Santa Croce in Gerusalemme, Rome, Italy, May 22, 2005. The relic of the True Cross is in the vertical and horizontal beams of the Cross in the photograph. The beam of wood outside of the Cross is from the cross of Saint Dismas. The case on the upper left of the Cross contains the goldened finger of Saint Thomas Aquinas that probed Our Lords five wounds. The case on the upper right contains two of the thorns from the Crown of Thorns. The case on the lower left contains one of the nails that our sins had caused to be hammered into Our Lord's Holy Body. The case on the lower right contains the wooden inscription carved out in four languages at the behest of Pontius Pilate and placed over Our Lord's Head: Jesus of Nazareth, King of the Jews.